Compound 3R-(4′-hydroxyl-3′-O-β-D-glucopyranosyl phenyl)-dihydro isocoumarin (GDC) is a natural isocoumarin, recently isolated from the stems of H. paniculiflorum. However, we know little about the effects of GDC on rheumatoid arthritis (RA). This study aims to investigate the protective effects and potential mechanisms of GDC against LPS-induced inflammation in vitro. Fibroblast-like synoviocytes (FLSs) obtained from synovial tissue of rats were induced by lipopolysaccharide (LPS) and treated with GDC. Cell viability was determined by mitochondrial-respiration-dependent3-(4,5-dimethylthiazol-2-yl)-2,5-diphenyltetrazolium (MTT) assay. Secretion of various inflammatory mediators was analyzed by ELISA and RayBio® Rat Cytokine Antibody Array. 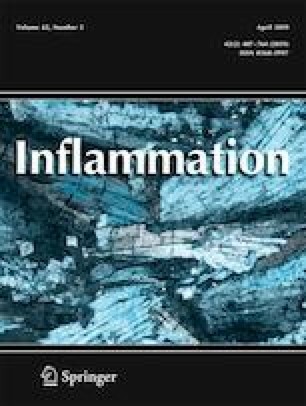 Potential mechanisms that are associated with anti-inflammatory effect were examined by Western blot. Results showed that GDC significantly inhibited the production of tumor necrosis factor alpha (TNF-α) and interleukin- (IL-) 6 induced by LPS. GDC also reduced the expression of inducible nitric oxide synthase (iNOS), TNF-α, IL-6, and IL-1β, as well as proinflammatory cytokines such as activin A, ciliary neurotrophic factor (CNTF), fractalkine, IFN-γ, IL-4, and TIMP-1. Moreover, GDC inhibited LPS-induced phosphorylation of extracellular regulated protein kinases (ERK1/2), p38 mitogen-activated protein kinases (p38), c-Jun N-terminal kinase (JNK), and IκB. And GDC also blocked NF-κBp65 nuclear translocation. All the results suggested that the protective effects of GDC against LPS-induced inflammation in vitro may be related with NF-κB and JNK signaling pathway. The project was financially supported by Key Laboratory of Tropical Medicinal Plant Chemistry of Ministry of Education of Hainan Normal University, the National Natural Science Foundation of China (NO.81370096), and Fujian Provincial Department of Education to Support Provincial University Special Project (No. JK2017023).